Introduction: Camden County, North Carolina, was settled when English settlers drifted down the Pasquotank River from the Virginia colony. 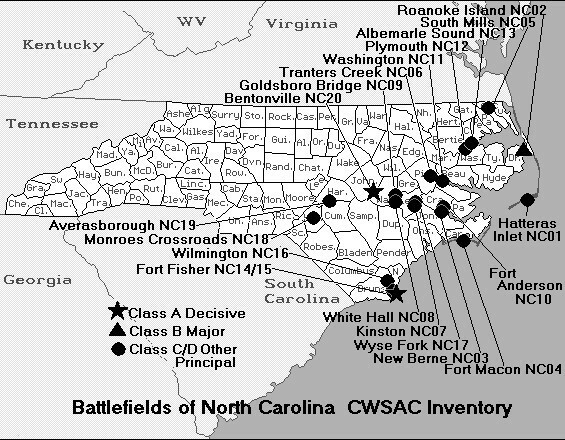 Camden County had an important role to play in the Revolutionary War, contributing 416 officers and soldiers, the most of any county in northeast North Carolina. The county split from Pasquotank County in 1777 to become an independent county. George Washington commissioned the construction of the Dismal Swamp Canal, which took twelve years to build; the construction period lasted from 1793 to 1805. The dirt that was excavated for the canal was used to build the bed of a toll road. (The location of the toll road is now the location of U.S. Highway 17.) The construction of the canal brought many economic benefits to the village of South Mills, such as the construction of mills near the southern locks of the canal. During the Civil War, the Battle of South Mills would be fought near the village on April 19, 1862. 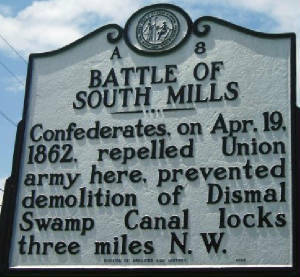 Among the few Confederate victories in that season was the defeat of a force sent to destroy the Dismal Swamp Canal locks at South Mills. Burnside ordered 3,000 men under General Jesse Reno to blow up the locks in order to preclude the chance that Confederate ironclad gunboats might be floated down the canal from Norfolk. The troops landed just south of Elizabeth City on the evening of April 18. Carrying with them two wagons of explosives, the Federals made a strategic error by taking a wrong road and adding ten miles to their overland route north. (They executed the mulatto guide who had misled them.) Weary and robbed of any chance of surprise, the Union troops meet 900 Confederates, commanded by Colonel Ambrose Wright, a few miles below South Mills. Battle: Learning that the Confederates were building ironclads at Norfolk, Burnside planned an expedition to destroy the Dismal Swamp Canal locks to prevent transfer of the ships to Albemarle Sound. He entrusted the operation to Brig. Gen. Jesse Lee Reno’s command, which embarked on transports from Roanoke Island on April 18. By midnight, the convoy reached Elizabeth City and began disembarking troops. Civil War Battle of South Mills, by D. H. Hill, Jr.
Sources: John G. Barrett, The Civil War in North Carolina (1963); William R. Trotter, Ironclads and Columbiads: The Civil War in North Carolina: The Coast (1989); Official Records of the War of the Rebellion; National Park Service.